Nearly 300 years ago, Isaac Newton pioneered the study of the movements of the visible universe (including famously falling apples). However, it wasn't until the early decades of the 20th century that physicists began to understand that things worked a lot differently at the atomic and subatomic levels, a field of research that came to be known as quantum mechanics. "After almost a century, I think physicists understand a lot of quantum mechanics, but we haven't really explored the usefulness of quantum mechanics," Carnegie Mellon University Professor of Physics Di Xiao said. His research in the past five years has aimed to change that. "Now I think we're at a new age — a quantum age," Xiao said. Broadly, Xiao seeks to understand what determines the properties of materials. This is a simple question with a lot of complexity behind it. For example, mercury and gold are neighbors on the periodic table and looking at their individual atoms closely shows very similar-looking particles. "But when you put many of them together, one becomes a liquid, one becomes a solid, one is expensive, but the other one is very, very, very expensive," Xiao said. Understanding why differences such as these exist when atoms are pushed together is the foundation of his branch of study in physics known as condensed matter physics. "I think it's safe to say that modern technology is entirely based on our understanding of how electrons travel in a piece of semiconductor," Xiao said, referring to the silicon-based computer chips living in computers, smartphones and so many other devices. Since their invention in the mid-20th century, these circuits have been improved and made smaller but still more powerful each year, allowing companies to make the ultra-thin smartphones we all crave. However, even as these semiconductors continued to shrink, designers were until recently still able to count on the electrons moving through them in the predictable manner found in classical mechanics. "Now we're talking about things moving around at a nanometer scale," Xiao said. "At that scale, you cannot ignore quantum mechanics." Fundamentally, what changes things at the quantum scale is that electrons cease to act like the particles we usually think of and instead take on the properties of waves. While this property introduces challenges, it also introduces new opportunities, something which Xiao has explored extensively in his research. One focus of Xiao's work has been so-called "valleytronics," an idea he thinks could revolutionize computing by exploiting the quantum properties of electrons in crystalline materials. The "valley" comes from the valleys of waves, the form which electrons behave like in quantum mechanics. The movement of an electron from higher-energy states to lower-energy states can be plotted like a wave essentially. These valleys are the states where an electron is at its lowest energy, and thus most stable. The spatial arrangement of atoms within crystalline materials means that there are multiple unique valleys that electrons can rest in at their lowest energy state. This is in sharp contrast to a classical particle, which only has one unique lowest energy state, namely when the particle is at rest. "If I can figure out a way to put the electron in "valley 0" or "valley 1," this is the equivalent of saying that I'm writing my data in "0" or "1," the language of computer binary code,” Xiao said. This would free up computers from relying on electric charge to program binary code. Xiao has figured out how to experimentally control the "valley index" of electrons in special materials with visible light, opening up a much more energy efficient way to connect computers together. "It's a new paradigm," he said. The idea behind valleytronics is related to some of the most beautiful concepts in mathematics, namely, geometry and topology. When Xiao came to the United States in 2001 and entered a doctoral program at the University of Texas at Austin, few people in physics took seriously complex mathematical study of physics dealing with geometric phase and topology, or the study of quantum waves and shapes and how they affect the materials made into them. "It had always been regarded as a really cute, elegant concept that probably doesn't have many physical consequences," Xiao said of his area of research. However, the field began to quickly take off as he worked toward his Ph.D. because physicists began to realize how important these concepts could be in dictating the properties of materials. "Maybe just purely by luck I ended up doing what I'm doing," Xiao joked. Following his postdoctoral work, Xiao took a job at the Oak Ridge National Laboratory in Tennessee. While working there was exciting and offered many opportunities, he eventually felt like his work lacked something. "I kind of just missed the feeling of being on a campus," Xiao said, and interacting with students in particular. In 2012, he came to Carnegie Mellon, a school that he'd heard was not too small and not too large with a strong focus on interdisciplinary research. He has no regrets since settling in Pittsburgh with his wife and two children, Ella, age 7, and Max, age 2. "I used to have hobbies," Xiao joked. "Now I just play with my kids." 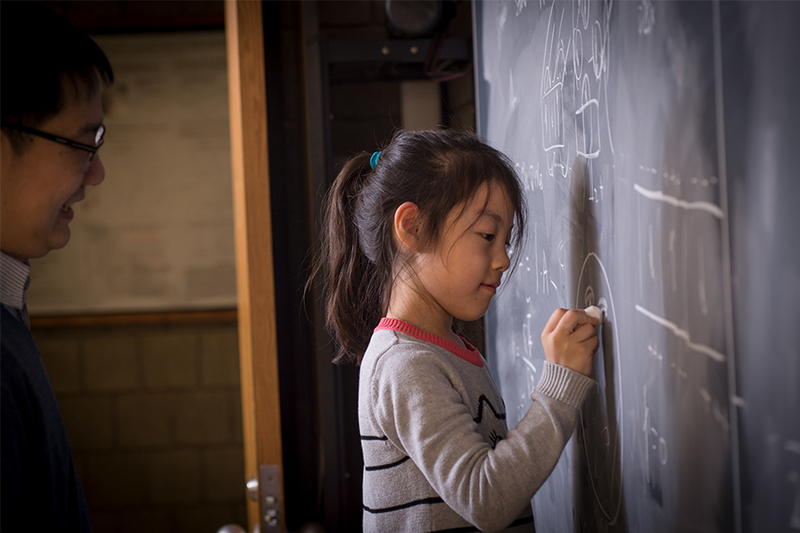 Outside of his research and parenting, Xiao has worked to improve the teaching of physics, especially to undergraduate students. For several years, he has run an exchange program between Carnegie Mellon's Department of Physics and the University of Science and Technology of China. Each summer, the universities trade undergraduate students for two months to encourage international collaboration and personal growth. Two years ago, Xiao was named a Cottrell Scholar, an honor that came with $100,000 to support the work of the nation's top educators. Xiao is using some of this money to develop a new tool that helps students understand the complex topics behind solid state physics through computer simulations. While visualizations have long been used to teach and understand physics concepts, Xiao said, this tool will allow undergraduate students to work to answer their own questions and experiments. "Instead of giving them a program, I want to give the student a code," Xiao said. "They can modify the code and they can have a full control of it." This idea came to him from his own experiences teaching undergraduate physics students at Carnegie Mellon, Xiao said, where he's long been impressed with not only the computer skills that these students have when arriving on campus but also the insightful questions they often ask him. He points to the fact that when he teaches first-year students, he has to manage his lecture time carefully because questions from the students could easily fill up the entire period. "When you have those kind of great students, I mean how can you exhaust what kind of questions they can ask?" Xiao said. "I want to see what the students can come up with."